1 In a small bowl, whisk together yeast, water and 1 teaspoon sugar until yeast is dissolved. Let stand 10 minutes until foamy. 2 In a large bowl or bowl of a stand mixer, add flour and make a well in the center. Add eggs, yeast mixture, butter and salt. Stir to combine. 3 Knead dough, adding more flour 1 tablespoon at a time until dough is smooth and elastic and only slightly sticky (about 10 minutes by hand and 5-6 minutes in a stand mixer). Shape dough into a ball and place in a lightly greased bowl. Cover and let rise until doubled, about 1 to 1 1/2 hours. 4 Punch down dough and roll out to 1/4-inch thickness on a lightly floured surface. Using a biscuit or cookie cutter or the rim of a glass, cut dough into 2 1/2-inch circles. Re-roll out dough as necessary. Cover circles with a tea towel and let rest 15 minutes. 5 Meanwhile, heat oil in a saucepan over medium heat to 370°F. Add doughnuts to oil 3-4 at a time, flipping over with a slotted spoon until both sides are deep golden brown, about 30 seconds. 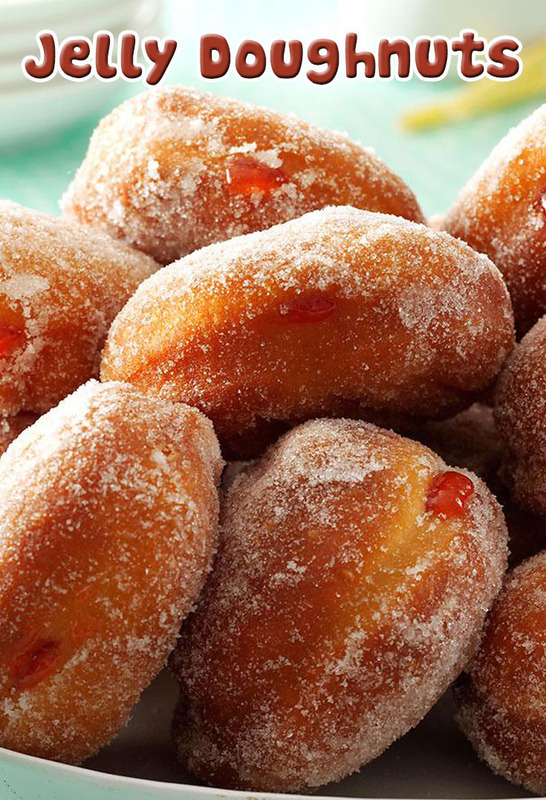 Remove doughnuts with slotted spoon and place on a paper towel-lined plate to drain. Repeat with remaining doughnuts. 6 Poke a skewer in the side of each doughnut. 7 Using a pastry bag with a narrow piping tip attached, pipe about 1-2 teaspoons seedless jam into each hole. 8 Sprinkle doughnuts with powdered sugar. Serve warm.